‘12 Studies’ forms a three-way journey through composer Bo Gunge’s (b. 1964) own life of music, a range of human moods and a series of western music’s most tantalising intervals. All twelve pieces, characterised by their simplicity and expressive clarity, are performed in both solo and duo versions; through this mirror the music shows its duality, born of a solid idea but let loose – uninhibited and free. I. Faithful and blue (alto saxophone & harp) 2:22 6,40 kr. I. Faithful and blue (piano) 1:45 6,40 kr. II. Sparkling blue (piano) 2:06 6,40 kr. II. Sparkling blue (violin & accordion) 2:06 6,40 kr. III. Dusk (violin & accordion) 2:00 6,40 kr. III. Dusk (piano) 2:11 6,40 kr. IV. Blues without words (piano) 3:06 6,40 kr. IV. Blues without words (alto saxophone & harp) 3:27 6,40 kr. V. Blue autumn (alto saxophone & harp) 1:34 6,40 kr. V. Blue autumn (piano) 1:13 6,40 kr. VI. Southern skies (piano) 3:44 6,40 kr. VI. Southern skies (violin & accordion) 3:11 6,40 kr. VII. White night (alto saxophone & harp) 1:46 6,40 kr. VII. White night (piano) 2:12 6,40 kr. VIII. Ocean blue (piano) 2:28 6,40 kr. VIII. Ocean blue (alto saxophone & harp) 2:42 6,40 kr. IX. Blue but not alone (violin & accordion) 3:26 6,40 kr. IX. Blue but not alone (piano) 3:56 6,40 kr. X. Aquamarine (violin & accordion) 1:44 6,40 kr. XI. Arctic blue (violin & accordion) 2:57 6,40 kr. XII. Cobalt blue (alto saxophone & harp) 2:28 6,40 kr. X. Aquamarine 2:38 6,40 kr. XI. Arctic blue 3:09 6,40 kr. XII. Cobalt blue 2:12 6,40 kr. Bo Gunge was born in the Copenhagen district of Frederiksberg and trained in music and drama before completing his composition studies at the Royal Academy of Music in Aarhus. He has since come to occupy his own, singular space in Danish musical life characterized by those firmly held beliefs. His music is usually tonal and often melodic, but just as often it is spiked with refracted elements of the avant-garde and governed by rigorous principles. Gunge has created symphonic music, chamber music, stage works, choral pieces and popular songs. He has written many pieces for children or non-professionals; some have been scored for non-Western instruments such as the Javanese gamelan. Commentators have long cited the expressive clarity in Gunge’s music, as if the ‘idea’ in question can be as much an emotional one as a musical one. That duality hints at some of Gunge’s working processes and structures, but it also tells us something about his own view of his role as a composer. ‘Music and the non-verbal arts hold a knowledge of the world that can be useful tools in handling the inevitable and partly irrational intensities of life’, he once wrote. 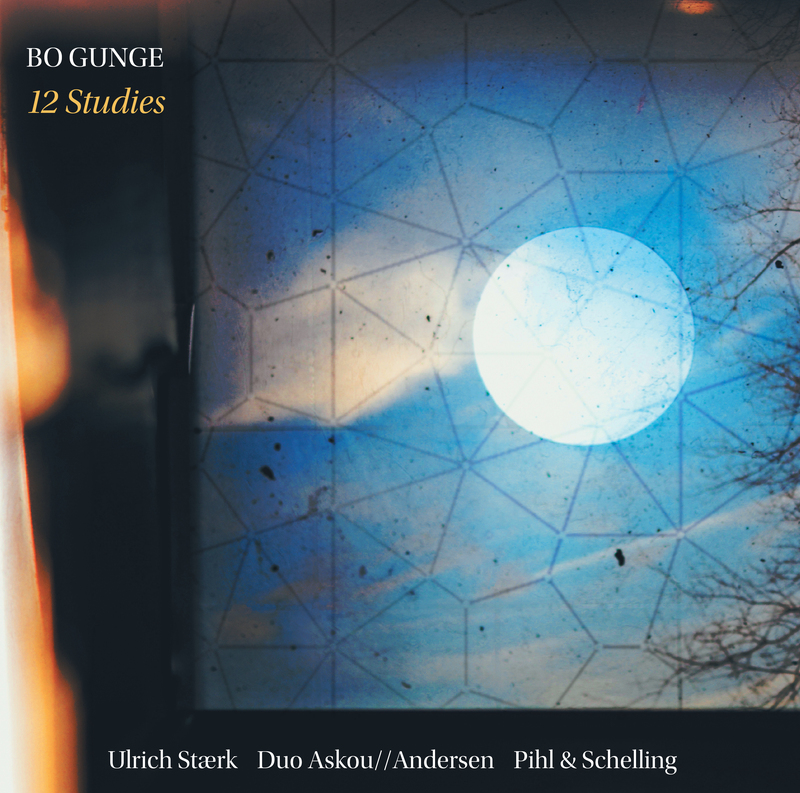 Bo Gunge’s 12 Studies (2014) reflect that comment in their dual exploration of human moods but also in their plotting of the composer’s own journey through a life of music. The twelve works were commissioned as two sets of six by the two ensembles heard on this recording: six for violin and accordion (Duo Askou//Andersen) and six for alto saxophone and harp (Pihl & Schelling). Following the first performance in 2014 of those duo versions at a concert in the city of Ribe (where Gunge lives), the works were re-scored as 12 straight piano. studies. They were first performed in that new guise by Ulrich Stærk in 2015. This recording presents both versions of each study, making 24 performances in total: the 12 studies for piano, alongside six of them in violin-accordion clothing and the other six on saxophone and harp. Gunge’s score has a pre-classical simplicity that the composer purposefully envisaged as a gesture of invitation to his musicians; in a rare act in Western music, not least for Gunge, it is written completely without expression markings and key signatures and is frequently freed from the metrical tyranny of the bar-line. The interpretative differences induced by that lack of rubric will, Gunge says, ensure the music lives only by its performance and by our engagement with such performances as listeners. But audiences have ideas as much as composers and musicians; any rendition of 12 Studies will be experienced by listeners in as many different ways as it can be interpreted by its performers, perhaps even more so. Either way, Gunge’s ‘idea’ has the capacity to explode into many thousands. In the same way, his music can pose very different ideas according to its scoring. In the piano. version of no. 2, ‘Sparkling blue’, we hear the right hand of the pianist reel-off a continuous line of quavers like a spinning wheel. In the same version of that piece for violin and accordion, the two musicians – with the very differently technical actions of their instruments – pass that busy string of quavers back and forth to one another in the manner of medieval hocket. That device is used throughout 12 Studies, rendering familiar music entirely different: two-sided, yes, but co-dependent or confrontational? Over to you. Gunge started work on the duo versions of 12 Studies shortly before his fiftieth birthday. The idea was to explore a series of western music’s most tantalising intervals – as in, two notes separated by a specific tonal integer. The most readily detectable of such intervals are the minor and major third; a ‘gap’ of three or four semitones. When jazz and blues musicians talk of the ‘blue note’, they also refer to more exotic intervals such as the diminished fifth or minor seventh – intervals that hold within them all manner of slippery harmonic implications which tease the ear. But, in the manner of Johann Sebastian Bach, Gunge was keen that his cyclic work should embody a mild stock-taking of his musical life to date. Thus each movement carries with it a specific mood that is often coloured by an experience or encounter, in Gunge’s words, ‘from my gradually growing life in the world of music.’ In individual studies, we sniff the scent of Bach, Bartók and Stravinsky as well as rock and Latin American music. Perhaps no. 4, ‘Blues without words’, has the most overt shape of a popular song or ballad, while also echoing, via its ‘new’ view of conventional tonality, Gunge’s comment that his music ‘goes around the traditional avant-garde way of thinking without rejecting it.’ In no. 1, ‘Faithful and Blue’, we might hear a pre-cursor to the hocketed quaver line of no. 2, in this case a broken stream of semi-quavers taken care of by the pianist’s right hand but divided between the saxophone and harp in the duo version. No. 3, ‘Dusk’, speaks of Gunge’s combination of control and freedom in music that is mostly bereft of bar lines and written instead in the manner of a recitative. Again the ‘holding’ material is passed from instrument to instrument in the duo version; perhaps the ambiguity of dusk is there in music that has the potential to breathe in a multitude of different ways. In no. 5, ‘Blue autumn’, we don’t have to wait for the duo version to hear the material tossed between voices, as the rhapsodic tune is passed from high registers in the pianist’s right hand to deep ones in his left. In the duo version of no. 6, ‘Southern skies’, we hear those exotic diminished fifths but they are emphasized even further as the little appoggiaturas of no. 3 have metamorphosed into full-on, teasing glissandos as flights from the violin overlay the inky darkness of the accordion. The harp’s resonance is altogether different, not least its more delicate way with harmonies that makes the major sixth and/or minor seventh chords in no. 7, ‘White night’, that bit more elusive. That quality gives a fascinating double tint to the separate renditions of no. 8, ‘Ocean blue’, whose homophonic block chords play with our expectations of harmonic resolution using minor sevenths; the music only half resolves itself at the end, and by stealth from underneath. No. 9, ‘Blue but not alone’, in duo form, is scored almost as a duet for the solo accordionist’s two hands; the violin then creeps in between them before climbing upwards in an act of chromatic derring-do. Soon both instruments share the melodic material, and finally reach a rhythmic accord too. There is a delicious stride to no. 10, ‘Aquamarine’, whose cartoon-like gait and 6/8 time signature stumble occasionally into crunching, crashing Beethoven-like chords. After the unified piano. scoring of no. 11, ‘Arctic blue’, the violin and accordion rendition suggests an occasionally uneasy dance between the two instruments as they eye each other as if from a distance. The set closes with what feels like an invitation to new beginnings; no. 12, ‘Cobalt blue’, uses all the ‘blue note’ intervals and is characterized by tightly interlinked gestures from left hand and right hand (or saxophone and harp) that initially edge their way upwards with appoggiatura like flicks, before later soaring skywards with flourishing upward runs that traverse those intervals. Gunge’s idea stands firm, but his music is let loose – uninhibited and free. Andrew Mellor is a journalist and critic with a particular interest in the culture and music of ­Denmark and the Nordic countries. The work on these recordings was undertaken by the producer Torben Sminge and me, Bo Gunge, in a comfortably weird teamwork, full of ideas. He and I were certain that the score’s invitation to engage in a personal interpretation not only reached out to the musicians, but also to us in the studio. From the beginning, everything was prepared in such a way that an individual soundscape for every movement could be created. Should the instruments be heard from the closest possible distance or from afar? How much of the concert hall’s own acoustics was ­needed, and how much artificial reverberation? What kind of stereo perspective? Whilst ­working, I sometimes believed the production would be very radical. In one or two of the movements the sound was so dry, so naked that, were it not for the quality of the performances, it would have been unthinkable. And once or twice, the violin seems to be standing in the middle of the accordion. It also happens that a huge artificial reverb has been added around a few notes. But in the end I realized that the efforts in the studio could almost not be heard at all. The production was so closely related to the music and to the interpretations, that it merely prolonged, in a natural way, what was already there, at the heart of the matter.